The cast of COME FROM AWAY, Photo by Matthew Murphy, 2016. Cassandra Hsiao & Sharon Wheatley. Courtesy of Cassandra Hsiao. There’s something about Sharon Wheatley that just sparkles. And just like that, our interview kicked off — except Wheatley was interviewing me. I had spent the past few days wandering New York City on my fall break, indulging in the anonymity at various coffee shops and seeing shows alone. But here was someone who knew at least some part of my story, even via a Google search, and was genuinely interested to hear more. I felt the iciness of anonymity begin to melt away. I gently reversed the flow of the interview by diving into the origins of “Come From Away.” Wheatley told me she had never heard of Newfoundland’s story until she read the script more than a decade after 9/11. “American airways were so saturated with what happened on our own soil that day,” she said. As the production process at La Jolla in San Diego kicked off, she found herself asking the same question over and over: Is this true? She wasn’t the only one. 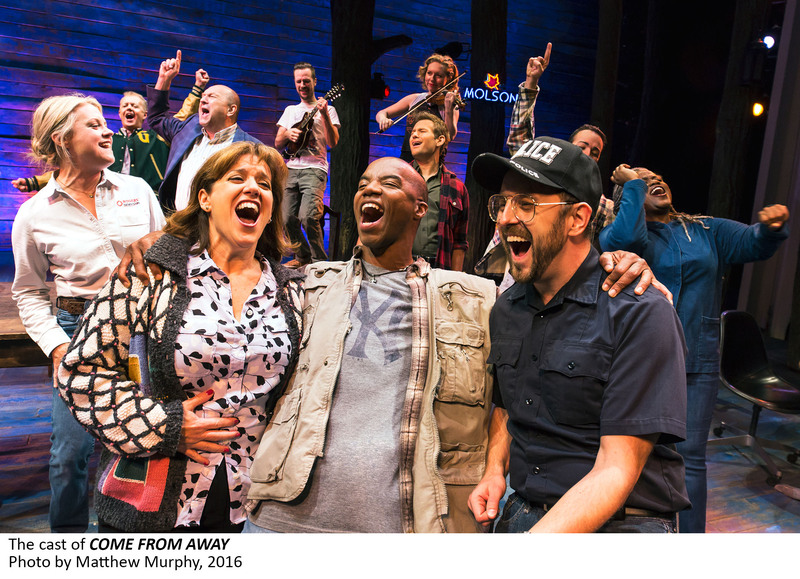 “Come From Away” sources its power from the truth of these events that unfolded on an island off the coast of Canada. On September 11, 2001, a tiny town doubled in population when they welcomed 6,700 strangers off 30 planes that had been diverted from their destinations, due to the terrorist attacks. Along with the eight musicians in the band, the 12-person cast tell the story of both Newfoundlanders and newcomers, each character drawn from real-life inspirations. The cast of COME FROM AWAY, Photo by Matthew Murphy, 2016. Sharon Wheatley (center) as her character Diane. Wheatley’s character, Diane, was inspired by Diane Marson, who met her future husband Nick Marson at a shelter in Newfoundland after her plane was diverted from landing in Houston. Their love story is a main tenant of “Come From Away.” Though minor parts are dramatized, it remains true to their story, even down to the poignant scene of the two looking out over Dover Falls, or a funny comment a flight attendant makes about their romance. When Wheatley met Marson in 2015, the actress immediately took a liking to her. Not only did Wheatley adjust her accent to more closely match Marson’s, but also took on Marson’s outlook on life. Lee MacDougall, Sharon Wheatley, Diane Marson, and Nick Marson pose at the Dover Fault. In Diane Marson’s real-life case, it was deciding to be vulnerable to Nick Marson and falling in love with him, despite the darkest circumstances that brought them together. As impossibly heartwarming as it sounds, the Marsons were not the only ones who seized the day so to speak in the aftermath of 9/11 — the tragedy forced many to reevaluate their lives. Wheatley believes the events of 9/11 touched everyone’s lives, even young people like me and her daughters, in both explicit and implicit ways. We bring these emotions with us to the show. She told me her favorite parts of the musical are the opening and the curtain call, the two times the cast stands on the edge of the stage and looks out into the audience, taking in their reactions. She has two daughters, one my age and one ten years old. Wheatley hopes that they carry the message of the show with them forever: that little things mean a lot. The people of Newfoundland opened their homes in the spirit of hospitality and compassion. That made all the difference. Wheatley hopes to be as vulnerable and honest as her character in her day-to-day life. She believes the polarization of politics can begin to be solved with something as simple as a dinner with neighbor. “It’s so hard. It’s really hard. But maybe that’s what I want to say, do things that make you feel vulnerable,” she said. As our interview comes to a close, she hypothesizes that out of the 12-person cast, the PR team selected her for our interview because she’s the only one with kids. Before she leaves, she asks me if I need anything at all during my stay in New York, to reach out to her. I ask if she mothers the rest of the cast like this and she nods, grinning. After she says goodbye, I am left thinking they’re the luckiest cast in the world. Because here in the middle of New York, a city of missed connections and hustle and bustle, one connection had been made: Wheatley making an effort to be vulnerable in our interview, recognizing me as more than a mere reporter, and affirming my presence, essentially declaring one of “Come From Away’s” taglines: you are here. Courtesy of Come From Away. New block of tickets now on sale through June 16, 2019. Visit https://comefromaway.com for more information.